After being persecuted and chased out of Thessalonica (Acts 17: 1-9) Paul and Silas went to Berea and had much success among the Greeks there, men and women (Acts 17: 10-13). But when the Jews of Thessalonica heard that Paul was in Berea they came and made trouble for him. (Acts 17: 13). Paul fled to Athens while Silas and Timotheus remained in Berea. The plan was for them to meet up with him later. While Paul was waiting for them in Athens he was very troubled by the wickedness of the people and began to preach to them in the synagogues and in the market place (Acts. 17: 16-17). 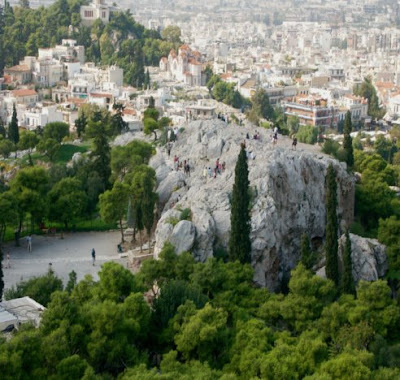 Some philosophers of the Epicurians and Stoicks found him and took him to Areopagus (Mar's Hill) where the civil council met (Acts 17: 18-21). Paul preached to them, and while most of them mocked him a few believed him and "clave unto him" (Acts 17: 22- 34). She has been made a Catholic Saint, "Saint Damaris of Athens", and in the Eastern Orthodox Church, her day is celebrated on October 2nd and October 15th for Orthodox Christians. As a participant in the Areopagus she would have been exposed to many different philosophies and ideas about God, the world and life. It is a credit to her that she was able to recognize truth when she heard it and had the faith to chase after it. Understanding the true nature of God is the basis for any strong testimony. Women in Athens didn't have much opportunity for education or participation in civil life, I wonder why and how she seems to be more educated and was present at the conversations at the Areopagus? How do you imagine that joining the Christian church changed her position or place in society? How would it have influenced her life? How and where did you first gain a testimony of the true nature of God? How has this changed your life? I wonder why Damaris isn't a more popular girl's name among Christian families? I think any woman would be proud to be named after her! Very nice post. My name is also Damaris is nice to know it comes from a good place. We named our daughter "Damaris" as a result of s decision to please both Grandmothers. One s Demetra and the other Marina. My ex-wife's mom had 3 GDs and my mother none. Grace Davidson, a distinguished Radcliffe College (Harvard) grad and Journalist took my dilemma under voluntary advisement. She was so well read and worldly that she brought the name to our attention. Now, 35 years later, this name has withstood the test of time. I believe the nature of the name and the bio of ST. Damaris live on thru my Daughter. I have been reading through your lists as I prepared for YW Girls Camp. Our theme was heroes and we chose women of the scriptures. I stumbled upon your blog as a result of researching for this theme. I have thoroughly enjoyed every moment reading about these wonderful women. Thank you so very much for all the work and research you put into these. I appreciate even more your personal thoughts. They have truly helped me try to ponder and liken the scriptures to our day. I have a sister in law named Damaris and I've often wondered about the New Testament Damaris she was named after. Thanks again for sharing your light!